Pulp Paper - Canada Forgings Inc. The pulp and paper industry heavily relies on forgings to provide them long-lasting equipment and fewer breakdowns. Forgings, as opposed to other alternatives such as tubing or rolled bar, provide durability and a longer service life. CanForge helps this industry meet all of their supply and paper converting maintenance needs. 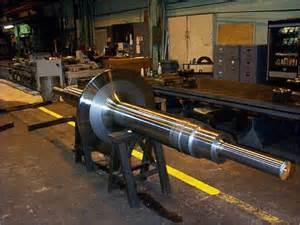 We provide forgings that are custom-sized, either in singular or multiple pieces. One of the advantages of forged parts in the paper industry is their near-net shapes, which uses less material and thus saves you money. After machining, forged step shafts build journal hardness retention, which does not happen with rolled bar. Unlike mechanical tubing, a forging’s advanced grain structure produces sharp engraving results. CanForge's wide-ranging inventory contains ferrous and non-ferrous materials in a variety of grades. We offer forged parts that can be heat treated, tested, rough machined, or any combination. No matter what the measurements may be, CanForge has the parts you need, whether for maintenance or a breakdown. Call or email CanForge today for your mining forging needs.